2) Can be safely painted to match any home décor without affecting reception or resulting in signal loss. 6.If your TV has no built-in tuner, you can add an ATSC digital converter box to receive the HD signal. Search B01N5MLC1M on Amazon for the 1byone Converter Box. 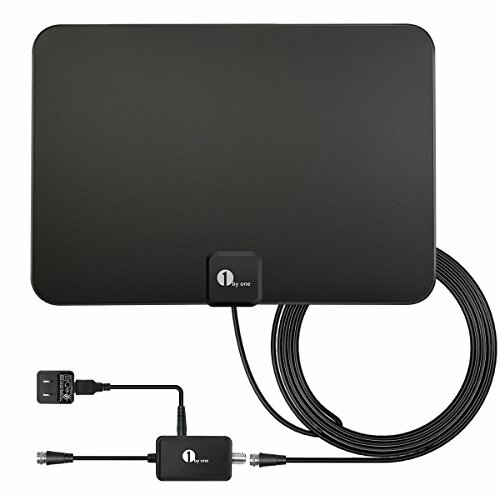 Paper-Thin Design - Super thin with 10ft coaxial cable to make installation anywhere in the home extremely easy. Hide it behind the TV, lay flat on a table, or stick on a window or wall. Satisfaction Guaranteed - We provide a 30-day full refund and 12-month warranty with friendly customer service. If you have any issues with reception, please feel free to contact us and we will provide full technical support.